Reflection contributes to self-efficacy–one’s confidence in one’s ability to learn. DEFINITION: What is Reflection in an arts integration PD experience? Reflection strengthens understanding. While a PD experience is a joyful and learning-filled process, in order to fully comprehend the purpose and relevance of the experience and to build capacity with the skills and their application, participants require time and guidance to reflect on each moment throughout the experience. Articulating reactions to and about an experience. Rethinking initial ideas or opinions in light of new information. Identifying how revisions improved one’s work. Observing and responding to the work of others. Listening to, building on and connecting to the work and ideas of collaborators. Making connections between the arts and other subject areas. PURPOSE: Why is Reflection important to an arts integration PD experience? Educational philosopher John Dewey (1933) wrote that understanding “means that the various parts of the information acquired are grasped in their relation to one another; a result that is attained only when acquisition is accompanied by constant reflection upon the meaning of what is studied.” (p. 78-79). In other words, reflecting is learning. While participants may achieve satisfying success when participating in a learning experience, it is reflection that helps them not only put their learning into perspective, but also become more cognizant of the new skills and knowledge they have gained and how to apply them to future experiences. “…a performance differential when comparing learning-by-doing alone, to learning-by-doing coupled with reflection. (W)e found that the effect of reflection on learning is mediated by greater perceived self-efficacy. Together, our results shed light on the role of reflection as a powerful mechanism behind learning. Learning from direct experience can be more effective if coupled with reflection— that is, the intentional attempt to synthesize, abstract, and articulate the key lessons taught by experience. Through regular and purposeful reflection, participants increase comprehension, build and extend their skills and, possibly most important, participants develop their own capacity as learners. As mentioned in the quote above, reflection contributes to self-efficacy–one’s confidence in one’s ability to learn. With self-efficacy, even if participants encounter obstacles or struggle over a particular task, their confidence in their own ability encourages them to work through the issue, knowing they will ultimately benefit. I never really thought about using dance. And so it was really special for me to see how well it actually fits together. Actually, it’s like the perfect component to a science unit plan or a lesson plan for those students that are struggling or for those students that do need to move around or just to see a different kind of thinking and complex thinking. It just opened my eyes, and I’ll probably use it till I stop teaching. 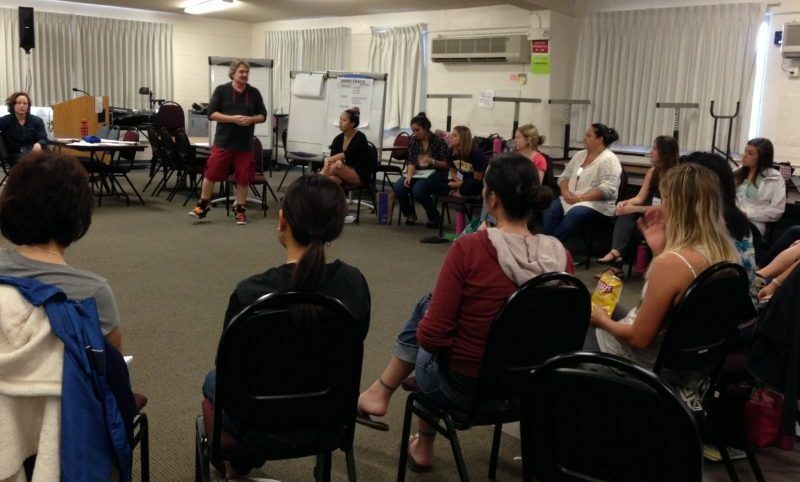 IN PRACTICE: How might Reflection be applied to an arts integration PD experience? In a PD experience, reflection fulfills two important purposes. First, the teaching artist guides participating classroom teachers to reflect on their ongoing experiences in the workshop and potential related events. Second, the teaching artist guides classroom teachers to consider the purpose and application of reflection with students. Reflection starts with questions that encourage dialogue between collaborators – teaching artist and teacher, teacher and teacher, teacher and student or student and student. Open-ended questions that contribute to new insights or ideas, which often begin with how or why, generally prove to be most productive and beneficial and can lead to new, possibly more in-depth questions. Questions that have a set answer (“What colors are in that painting?”) are primarily assessment questions, not reflection, although reflection and formative assessment are closely aligned (see Assessment). Rolfe, Freshwater & Jasper (2001) suggest that reflection at an elemental level consists of What, So What and Now What. The chart includes the types of questions that might be considered at each level. As they engage in creative movement, the teachers “Look For” evidence of their assigned pedagogical topic. Afterward, they discuss observations, questions, and adaptation ideas regarding their topic as a small group. Finally, each group shares their big ideas and/or questions with the full group of workshop group. • What will they need to consider and/or establish before beginning? • After experiencing a drama strategy: What did you notice about yourself as a learner while participating? What did you notice about the way I facilitated you in the strategy? • After experiencing several drama strategies/activities: What skills are being developed in students through these strategies? Why do you think students might be engaged by this approach? • After experiencing a full drama lesson: How might you adapt this process for your students? Where do you see the strongest connections with Depth of Knowledge levels? Which standards are being most directly addressed? In a 3-hour PD experience introducing the use of Boomwhackers (tuned plastic tubes), each classroom teacher conducts a group of peers in a rhythm circle. Following their experience conducting, they engage in small group discussions to reflect on their experience with leading the activity. Some of these reflections are subsequently shared in the large group. After conducting with the instruments, teachers use the approach to explore arithmetic concepts, including fractions and percentage. Some of the reflection prompts are repeated in regard to a second activity, and teachers discuss and share in a similar fashion. • What did you find easy about conducting the group? • What did you find challenging? • What might you try differently next time? Why might that improve the outcome? • How would you need to adapt this activity for the students you work with? For language learners or special education students? • How will you assess student’s progress and learning? • What additional practice do you need to feel confident conducting the ensemble? • What is the benefit of this approach? • How did drawing from touch affect the way you gathered information about your object and how you drew it? • What was it like using your own senses to explore the object first, before learning anything about it from outside sources? • How might you adapt this activity for the students in your classroom? Reflection can encourage more than immediate answers. 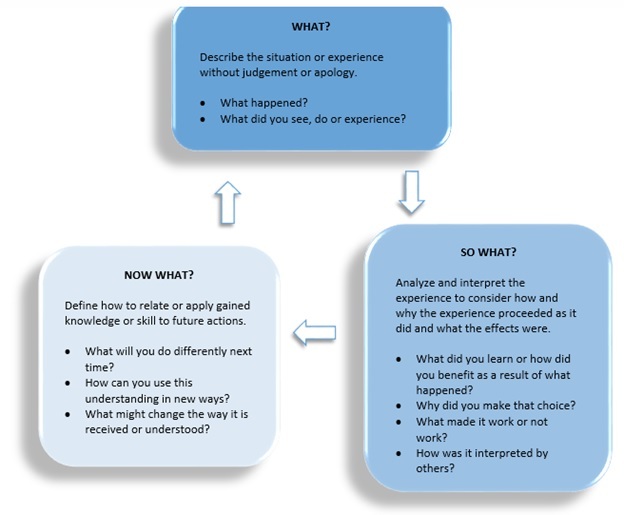 At the beginning of a learning experience, reflection might inspire wonder and curiosity, such as with an Essential Question (See Learning Targets). Such questions do not always need or benefit from immediate answers and can focus participants on the greater purpose of the coming learning experience and offer a goal for what they might eventually discuss. In addition, an Essential Question might inspire other questions along the way. Those reflections may provide insight to help address the essential question of the learning experience. If a PD experience gives time for classroom teachers to write potential lesson plans, reflection might include a formal tuning protocol in which the classroom teachers share their ideas with others (See Resources). With reflection, the optimum goal is 100% participation. When every participant reflects, every participant potentially gains with a deeper understanding and appreciation of arts integration. The question a teaching artist may wish to ask is, ‘What might be the barriers to reaching 100%?’ If participants are shy about speaking in front of a group, or if a small cadre of participants are adept at getting off-topic when left to their own discussion, what reflective activities might encourage or focus them? There are many ways to conduct a reflection moment, from volunteers giving answers, to groups discussing and sharing out answers to more in-depth protocols (see Resources). Reflection is such an essential part of a learning process that teaching artists might wish to consider multiple points for reflection to happen during a PD experience, and multiple ways to conduct the reflection sessions in order to clearly demonstrate for teachers how to maximize the beneficial effects of reflection. Ways the experiences affected them as both teachers and students (“What did you notice about yourself as a learner?” “How did the art experience affect your understanding of the content?” “How did the experience engage you or affect how you interacted with others?”). Classroom teachers considering ways to apply the workshop experience to the classroom. 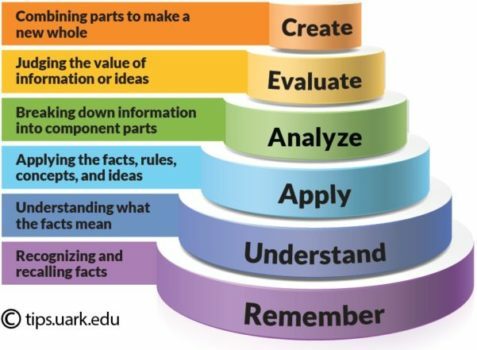 Connections between the modeled strategies and techniques and Webb’s Depth of Knowledge and the revised Bloom’s Taxonomy (Anderson & Krathwohl 2001). The various ways students might benefit from the art, strategy, or lesson. Effective ways to guide students to reflect on, revise and respond to their art work. Why arts experiences affect the way students learn. How to adapt the strategies or techniques for specific grades or special needs. What the teachers experimented with in their own classroom. How the students responded when participating. Students’ responses to the lessons and their resulting artwork. How the teachers might or did revise or improve their efforts. Which standards are most directly addressed.